Sven was: a pr-genius with a smart, pretty wife and lovely daughter. Successful, in the know, always at the best parties and generally acknowledged to be a really cool guy. One of the coolest, actually. Sven is: a wreck of a man. Divorced, depressed, lives with his parents, works as a mall mascot in a giant polar bear suit. Someone you would most definitely call a looser. After a major personal break down Sven is trying to get back on his feet and is forced to work as a mascot at the brand new, all eco-friendly mall Swedish Homes which is an absolute dream of Scandinavian design. A retail palace, where you dreams can come true and where you can splurge all you want completely free of guilt. Everything is here to make you feel cared for, pampered and happy; the walls are white, the muzak is soothing, the coffee is fair trade, the escalators rise slowly to let you take in the view. Isn’t that nice and lovely, don’t you feel all calm and happy and ready to shop? Sven however soon discovers that behind the scenes the mall is not at all peaceful and serene, in fact a war is being a fought. The rather frightening mall guard Kevin stops at nothing when shoplifters are concerned, and Sven is increasingly concerned for Kevin’s mental health and also for the shoplifters. What does Kevin really do to them in the back room where no one else is allowed? 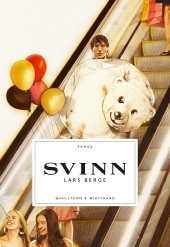 When Sven by chance discovers that his long lost love Isa is an avid shoplifter with a cause, skulking around the mall on dodgy missions, he’s torn between his responsibilities and the urge to help her. Isa doesn’t need rescuing, it turns out she has a plan, a rather dangerous one which will render the mall into a pile of dust. At least that what Sven thinks. WASTE is a story of two lost souls, and about how sometimes the easiest way to rescue yourself is to care for the people around you. And how a new pair of pants just won’t do that for you.